BARCELONA, Spain (AP) — Travelers wandering the streets of European capitals in search of old-world charm might just as likely stumble upon a bowl of Lucky Charms. In the last two years, cafes have opened in London, Paris, Madrid, Barcelona, Lisbon, Berlin, Hamburg, Manchester and many other cities. The trend also has a toehold in the Middle East. 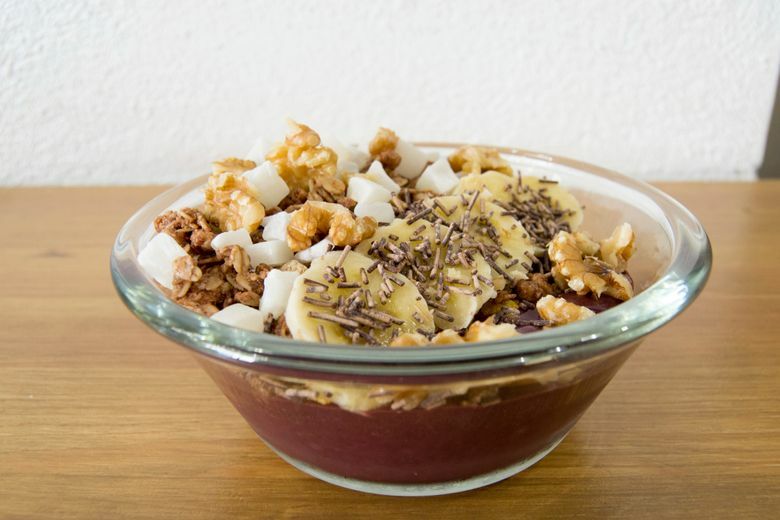 There’s no single model for the cafes, but they tend to offer at least 100 brands, dozens of fruit and candy toppings, sweet syrups, and several kinds of milk, including nondairy and flavored varieties. Many also serve coffee, cereal-flavored milkshakes, soft-serve sundaes or inventive takes on Rice Krispies treats, like tiered cakes made from marshmallowy layers of Fruity Pebbles, Apple Jacks and other sugary cereals. Rare varieties from foreign countries also bring in homesick expats. A classic bowl with milk is still the standard. But they’re often topped with combinations that go far beyond what most Americans would recognize as a breakfast banana sliced over Corn Flakes. 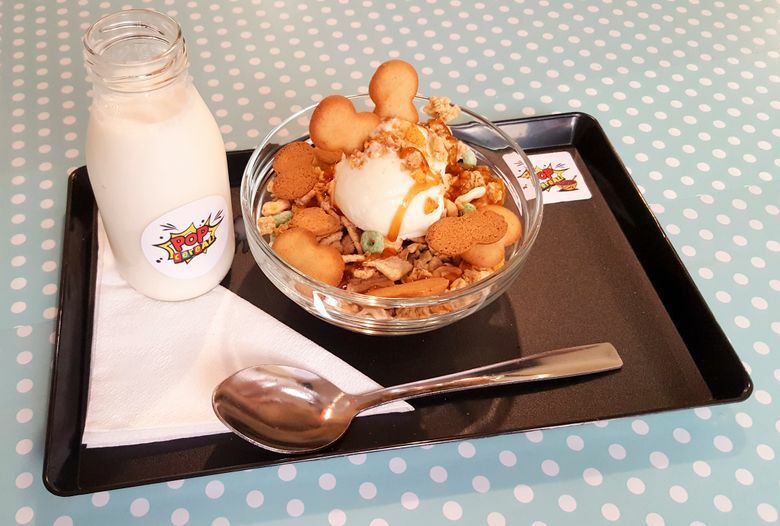 At Pop Cereal Cafe in Lisbon, one of the most popular is a mix of Froot Loops and Rice Krispies with mini marshmallows and dried strawberries, topped with strawberry syrup, a waffle cookie and a scoop of vanilla ice cream, served with a side of milk in a glass bottle. Brightly colored boxes line the shelves at Pop for practical and decorative purposes, and a bunkbed and padded benches let patrons doze off for a quick nap. Pop also has hosted events, such as a pajama party with a live band called Beliche, which is Portuguese for bunkbed. 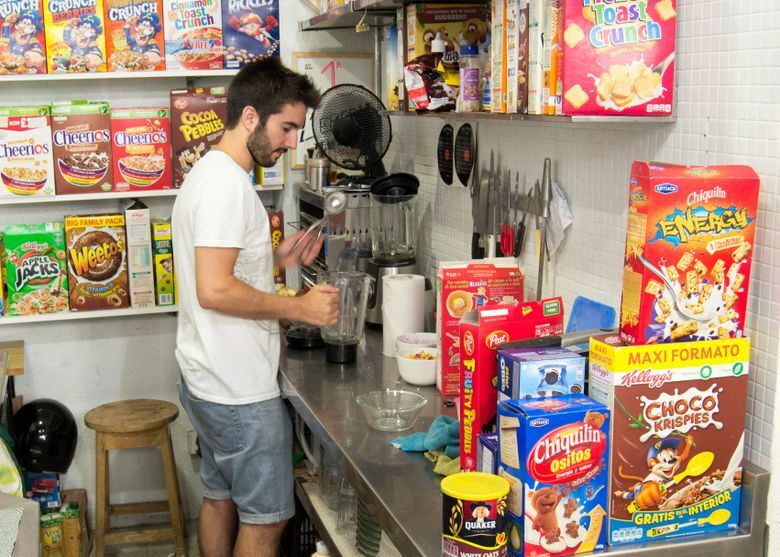 Vicente, who was a mechanical engineer until 2016, said they got the idea from seeing Cereal Killer Cafe in London, which was the first of its kind in Europe. 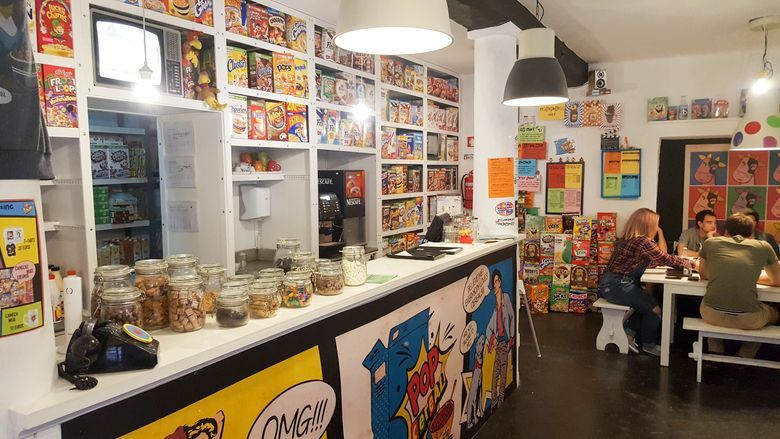 Identical twins from Belfast had opened it in 2014 after seeing cereal cafes in the United States and watching the 2007 independent movie “Flakes.” Now Cereal Killer has two more stores in England as well as branches in Jordan, Dubai and Kuwait. 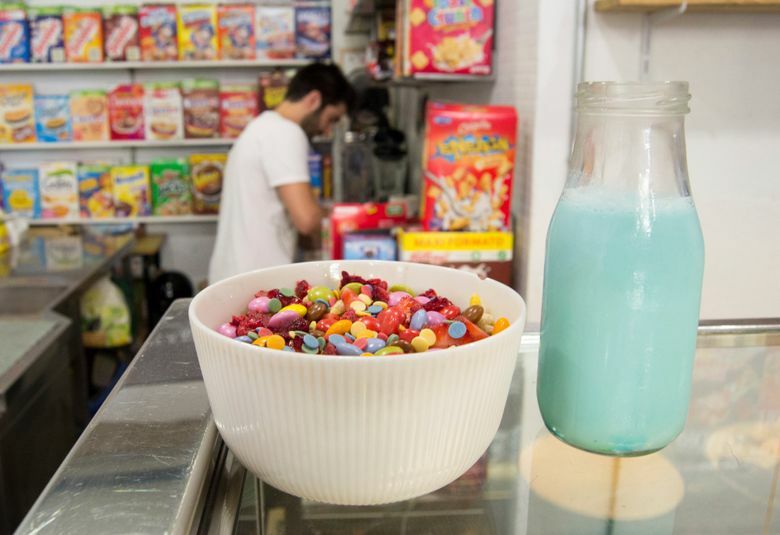 Cafes that had opened in Chicago, Florida and Texas have since mostly closed, but two flashy entries opened recently in New York, a Kellogg’s-branded flagship near Times Square and one inside a designer sneaker store in Brooklyn. Despite making inroads elsewhere, nowhere has the trend caught on quite like it has in Europe, whose grocery stores never stocked the hundreds of varieties that fill entire aisles of American supermarkets. 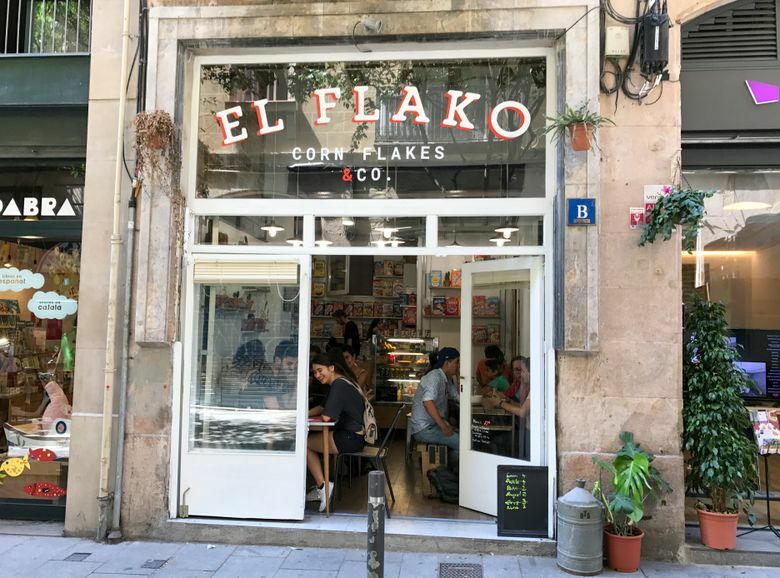 Nicolas Castan, one of three people behind El Flako in Barcelona, said the lack of experience led to some risky combinations after they opened in the spring of 2017. On one recent afternoon, all of El Flako’s 20 seats were filled, mostly with Spanish speakers who giggled at the menu’s fruity, chocolatey, honey or healthy combinations. Lining the white shelves around them were technicolor boxes of Sugar Smacks, Disney Princess and dozens of others cereals, as well as potted plants labeled with first names of famous rock singers like Patti, Jim and Alice. A soundtrack of The Doors, Jimi Hendrix and The Clash pumped out of the speakers. The combination of novelty and atmosphere were enough to bring Maria Roca, a 19-year-old student from the University of Barcelona, back a second time with a friend, Nuria Amor, 19.